Beautiful, bright vibrant colors in a unique design pattern. This cotton durry is 100% washable and also stone washed to give this color effect. It has a geometrical pattern Design and best for the kitchen. 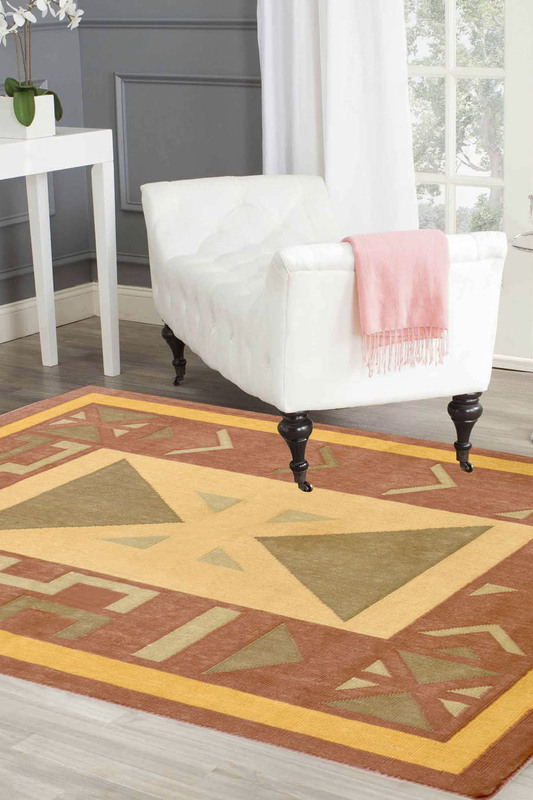 - This magnificent handmade cotton flat woven rug made in 100% finest quality of cotton yarn. - This is a traditional design in a Beautiful geometric pattern. - It has taken approximately two months to weave. - This Durry is woven by experienced weavers so as to assure them a perfect finish appearance. - The main colors are yellow and rust. The plain border in yellow color shows a different look. - It is suited for living room with bright color furniture. This is Reversible durry. - This cotton durry is 100% washable and also stone washed to give this color effect. Please note that lengths and widths may slightly vary from published dimensions although we strive to provide the most accurate measurements possible. Also, we do try our best to display the most accurate images. There might be a slight variation in color between the actual product and your screen due to a difference in computer monitors.